The Performance Tracking Module makes sales tracking and sales data management easier. Improve sales tracking by allowing salespeople and contractors to upload sales data from the field. Ask about improving your sales tracking with The Performance Tracking Module! Manage sales promotions and capture better, more complete performance and sales tracking data. The Performance Tracking Module is a complete sales and marketing tool with data collecting, sales tracking and performance reporting capabilities that help you with long-term, big-picture sales strategies as well as incremental sales growth. With The Performance Tracking Module, acquiring valuable sales data doesn’t eat into your busy sales and marketing planning schedule. The module’s mobile-friendly document upload tool allows you to capture purchase data from contractors out in the field and reward them instantly. Data exchange and sales rewards become part of the sale itself, as it happens! Your salespeople and contractors don’t have to go out of their way to submit the data, and you don’t have to go out of your way to acquire or find it. In addition, advanced reports and analytics deliver sales performance insights to help you track your sales goals. What are The Performance Tracking Module’s features and benefits? Salespeople can instantly upload invoices, warranty registrations and other documentation from their phones, wherever they are, to validate sales claims. Collect sales data through a digital file upload tool or a custom claim form. Schedule and manage multiple, simultaneous sales promotions. Set sales promotion eligibility based on role, region, organization, program activity level and more. To-the-point dashboards and in-depth performance reports, allow you to efficiently track sales goals. Automatically convert uploaded sales data from dollar amount to reward points. Define your reward points pay-out structure (ex. 100 points for every $1,000 a salesperson sells). Which pain points does The Performance Tracking Module help you solve? Salespeople are too busy out in the field to collect sales claims data such as invoices, warranty registrations, receipts, etc. Salespeople have no incentive or motivation to submit sales proof or documentation. Useful sales data is scarce. Your database lacks info about your end-users, or your distributors’ customers. Sales tracking data is difficult to analyze, so you don’t know how your sales incentive program is performing. Different people in your sales force or sales channel need different goals and sales promotions. Your sales strategies are short-sighted. Which types of incentive programs should use The Performance Tracking Module? Motivating sales reps in your sales channel comes with the extra challenge of discovering who these sales reps are and understanding their purchase habits. The Performance Tracking Module helps you better track sales and purchases with immediate, from-the-field sales claims acquisition and segmented sales promotions. The Performance Tracking Module was created to be a sales and marketing tool that grows your sales incentive program alongside your ever-changing sales strategies and goals. Use its tools and features to constantly increase sales motivation and engagement, discover new sales opportunities and areas for improvement. In channel sales, your dealers, distributors or resellers are your salespeople and your customers. A dealer or distributor loyalty program allows your channel sales reps to earn perks for choosing your products or services over your competition. This could be the differentiator you need to grow and diversify their purchases, while creating long-term brand loyalty. Which modules pair well with The Performance Tracking Module? 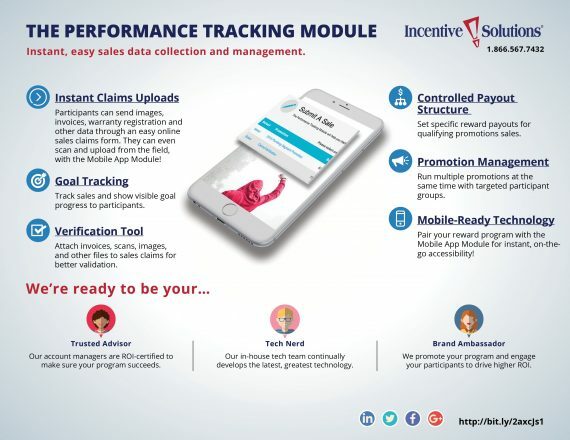 Providing on-the-go access to The Performance Tracking Module’s document upload tool allows sales reps to validate sales claims and receive reward points instantly. Immediate gratification equals greater participation! Learn more! Our integration services allow two-way data exchange between The Performance Tracking Module and other business or sales tools, such as your CRM. This module allows you to control the incentive program access and privileges of your program participants. When paired with The Performance Tracking Module, it helps you organize billing and reporting generated from sales activity. Display sales performance rankings of the top sellers to give any Performance Tracking sales promotion a competitive edge. Open enrollment allows anyone to sign up for your sales incentive program, as long as they have the URL. You can capture data from previously unknown customers or sales reps and incorporate it into Performance Tracking promotions.